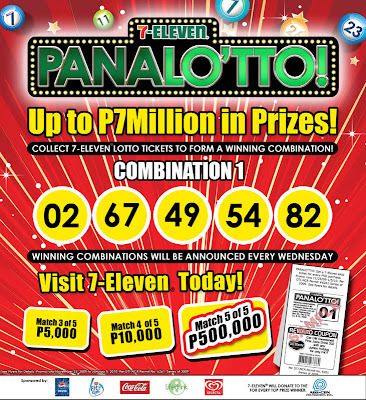 Save your receipts and have a lot of fun with the winning Panalo’tto promo from 7-11, as every 50-peso purchase entitles you to a lotto entry you can match or combine to win up to Php7 million in prizes! The lotto ticket also entitles customers to freebies or discounts indicated on the printout, so everyone walks away a winner. The popular convenience store kicks off this exciting promo to make their customers' Christmas merrier, and what’s more, they’ve pledged to donate a sum of money to ABS-CBN Foundation Inc. for every top prize winner. Winning combinations will be announced every Wednesday, which will be posted in all 7-Eleven stores and at 7-Eleven website. Match number combinations announced online or in stores to win. Three out of five numbers nets you Php5,000, while four out of five clinches a cool Php10,000. The lucky customer who manages five out of five will walk home richer by Php500,00 while ABS-CBN Foundation gets support for their charitable work. Go for the win and have fun by collecting receipts and buying your favorite products at any 7-Eleven store this holiday season. You just may have a handful of lucky numbers.